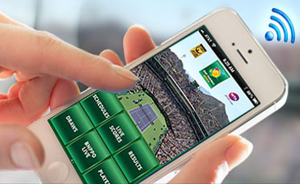 Screen shot of new BNP Paribas Open app from YinzCam. 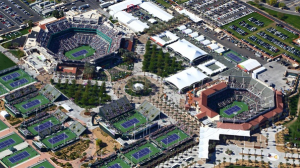 The BNP Paribas Open, one of the premier stops on the professional tennis tour, has tapped YinzCam to provide a new app for this year’s event that includes support for a wide range of services including ticket purchases, wayfinding, transportation to and from the venue, and a schedule of matches. The new app, available for iOS and Android devices, is the first tennis-venue app for YinzCam, whose market-leading list of customers is mainly in U.S. professional sports, including the NHL, the NFL and the NBA. 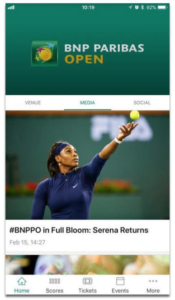 Reflecting YinzCam’s historic excellence in providing content to mobile apps, the BNP Paribas Open app will include biographies and photos for the more than 200 women and men players from the WTA and the ATP World Tour. According to YinzCam, the app will also support live scoring and real-time match results. Probably one of the more important features to fans at the Indian Wells Tennis Garden, the tournament’s host venue, is the interactive map, which provides information on food and beverage options as well as other services (restrooms, ticket offices, etc.) as you scroll through the map. YinzCam said the app also has a chatbot to answer questions, though when we tried asking it “will Roger Federer win?” it asked us to rephrase the question because it didn’t understand. 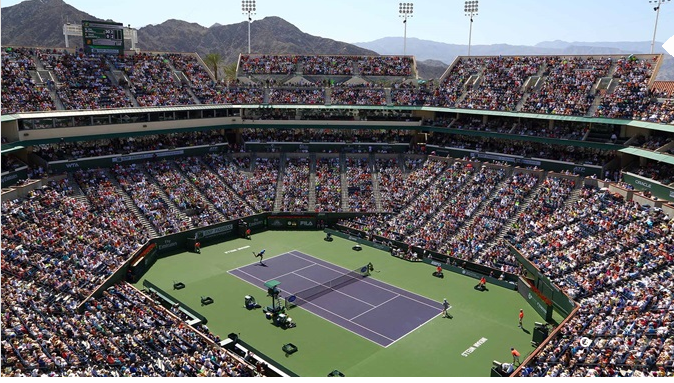 As previously reported by MSR, the Indian Wells Tennis Garden is well covered for Wi-Fi with a network using gear from Ruckus; apparently, the new app replaces the previous app developed by The App Company of Palos Verdes Estates, Calif. In tennis, a player gets two chances to serve the ball in. Mark McComas, lead project manager for the public Wi-Fi installation at the Indian Wells Tennis Garden in southern California, knew he’d have just one shot to get it all to work properly. McComas, VP for systems integrator West Coast Networking of Palm Desert, Calif., began working on a wireless system to handle IWTG’s administrative and corporate offices as well as handle box-office scanning in July 2013. 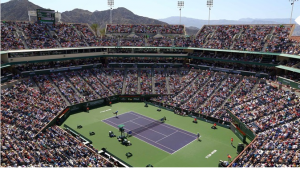 But then a smartphone app for the famed BNP Paribas Open tennis tournament with schedules, results, player bios and live streaming video got added to the mix, and IWTG’s public Wi-Fi network wasn’t so much born as mushroomed into being. 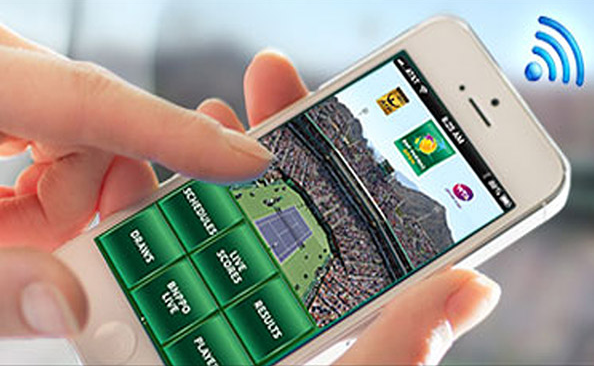 At this year’s tournament, where play in the women’s main draw started today, the 400,000-plus fans who attend over the two weeks of play will be able to once again use the app to enhance their on-site visit, with features like live video from different courts, updated stats and play-by-play audio coverage. It all runs on the free Wi-Fi service available at the venue, a project McComas and West Coast Networking helped deploy in time for last year’s event. 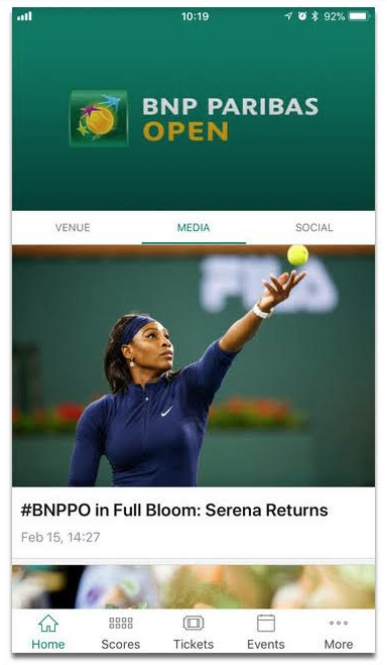 PR view of the BNP Open app. Usually you can’t see the Wi-Fi! — Ensuring sufficient bandwidth for the BNP Paribas smartphone app, developed by The App Company of Palos Verdes Estates, Calif.
— Configuring the subscriber gateway from RG Nets, Reno, Nev., that rate-limits onsite users to 5 Mbps upstream and 5 Mbps downstream. In addition to staff and thousands of spectators to satisfy, there was also the man who owns IWTG and the BNP Paribas tournament: Oracle billionaire Larry Ellison, who’s not exactly known for initiating group hugs. According to McComas, the tournament staff was great to work with and very technology-fluent. “They gave us the tools and expected us to perform and do it right the first time,” he added. The capacity of Stadium 1 is 16,000 fans; Stadium 2 has 8,000 seats. In addition, if a user connects at 2.4 GHz, if their device can support it IWTG pushes them to 5 GHz, which McComas said was critical since the overlap on the 2.4 GHz part of the spectrum is only three channels. Video streaming, video encoding and app hosting are all handled off-premises; that reserves bandwidth and processing power for onsite users, rather than hosting those functions for the entire world, McComas said. In 2014, McComas said IWTG had as many as 9,000 concurrent users on the tournament app, accounting for nearly 3 TB of data per day from the public Wi-Fi network alone. “It was insane how may people downloaded the app and were using it,” McComas laughed. In addition, IWTG had 4 Gbps of fiber in 2014 dedicated to the public Wi-Fi network; McComas said they’ll bump that up to 5.5 Gbps this year. They’re also adding about 20 additional APs around the venue to relieve potential congestion points. Terry Sweeney is a Los Angeles-based writer who’s covered IT and networking for more than 20 years. He is also founder and chief jarhead of Paragon Jams.